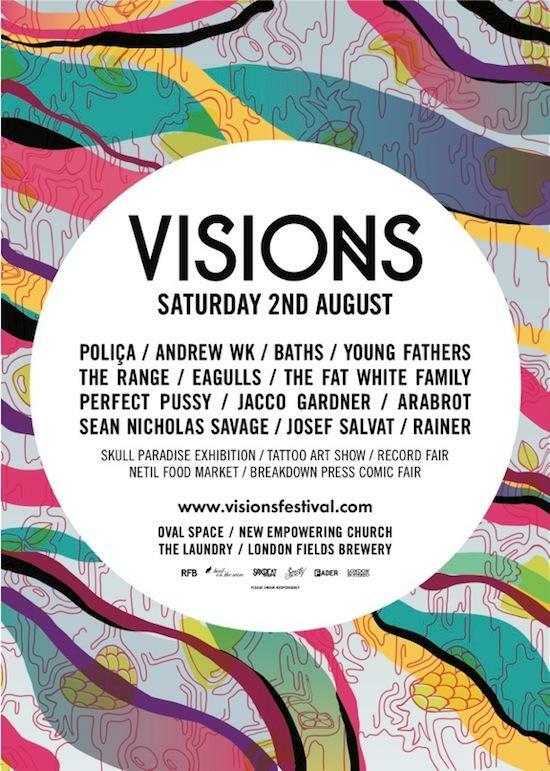 Visions, the excellent East London one-day festival, has announced that it'll be returning this summer, following 2013's inaugural edition, and has revealed the first names on its line-up. Taking place at Oval Space, The Laundry, London Fields Brewhouse and New Empowering Church on August 2, catching tQ's eyes on the bill are loveable scrag-ends The Fat White Family, Norwegian noise-wielders Årabrot and consummate party fan Andrew WK, alongside Jacco Gardner, The Range, Young Fathers, Baths and more. There'll also be a wide range of arts activity, including an exhibition by the Skull Paradise collective, a tattoo art show by Liam Sparkes and Breakdown Press' comic book fair.